Here's a new feature for The Digital Story: "How I Did It." 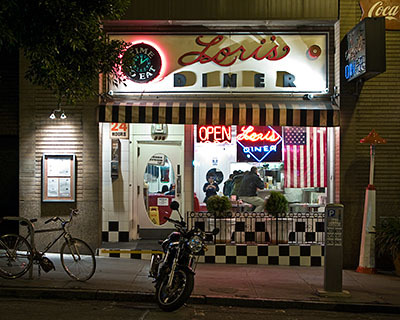 These are techniques from virtual camera club members who have built upon information in The Digital Photography Companion, or came up with a new tip altogether. The "How I Did It" tips will appear on The Digital Photography Companion mini-site, so we can build a living library of knowledge for everyone to use (and contribute to). If you have a "How I Did It" tip to share, just send it to me with the sample photo, and put "How I Did It" in the email subject. This week's "How I Did It" is from Hans Stolz. Hans attended my Five Shooting Techniques to Make Your Pictures Look Better than Everyone Else's at Macworld SF (which was based on content from Digital Photography Companion). 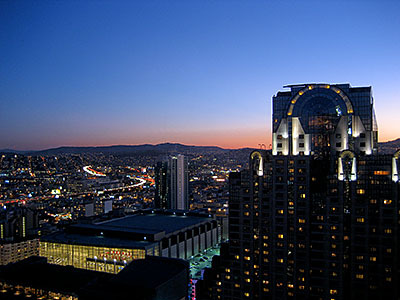 He liked the "Shoot at Night and Twilight" tip, and gave it a try from his hotel room in San Francisco. Here's what Hans had to say. "I own a Canon 10D and a Canon IXUS 65 camera," says Hans. 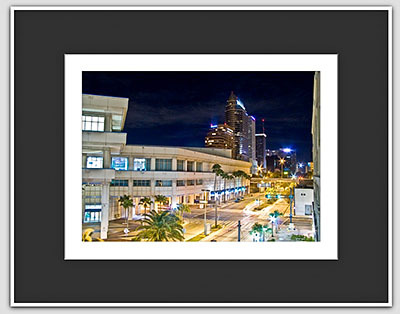 "The photo, however, was shot with the IXUS 65 in my hotelroom in the Westin (former Argent) after your talk at the MacWorld conference. I followed your instructions on night shots." "Here is how I actually did it:"
I used my office chair which I rolled to the window. The camera was positioned on the armrest of the chair. I adjusted the camera so that it didn´t look in a right angle to the window (I think that is better for focusing). I set the camera in manual mode, the ISO to 80, flash off and the self timer to 10 seconds. 2 seconds didn´t work because the chair was still vibrating after 2 seconds. All the lights in the room were turned off. "Fortunately, the Argent has floor to ceiling windows." Hans camera was set to: ISO 80, f-2.8 with a 1 second exposure. Thanks Hans for sharing your work and your ingenuity! 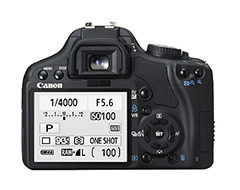 There are a lot of things to like about the just-announced Canon Digital Rebel XSi (450D). Inclusion of the DIGIC III processor is important. I'm using that processor in the G9, and it elevates the game noticeably. Also, 3.5 fps in a Rebel? My gosh, I don't have that speed in my EOS 5D. Having such a fast frame rate in a camera that sells for $799 US is a boon to folks who want to leverage burst mode. And you can shoot up to 53 JPEGs in burst, or 6 RAWs. Not bad at all. The 3" Live View LCD is also a nice touch. Canon has designed this LCD so you can use it at odd viewing angles. You know how hard it is to shoot through a DSLR at ground level. Now with Live View on this well-designed LCD, low-angle shooting won't be a back-breaking task. Believe it or not, I'm not as thrilled about the 12.2-megapixel sensor, especially if the DIGIC III can't control its noise at high ISOs. Since I haven't shot with the camera yet, it's too early to tell for sure. But I do know that my 10 megapixel XTi is nosier than the 8 megapixel XT. 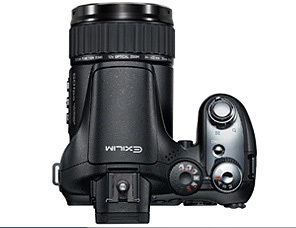 I'd like to see what the DIGIC III can do with a 10 megapixel sensor instead. But more to discover on this front. I should also mention that, if you do go for the kit with the 18-55, that lens is now optically image stabilized, and it only costs you $100. Something to consider. Overall, the Canon Rebel XSi looks like a great upgrade at a compelling price. I think its going to put great image quality and versatility in the hands of promising photographers... and the result will be more beautiful pictures. I'll follow up after I have a chance to play with the camera in Las Vegas at PMA. 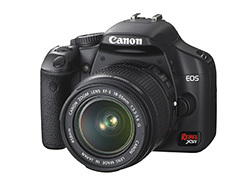 The Canon XSi is available on Amazon for $799 US. Since we don't have Geotagging in most of our cameras yet, here's a slick device for SD Card shooters that enables us to add GPS position data directly to JPEGs. 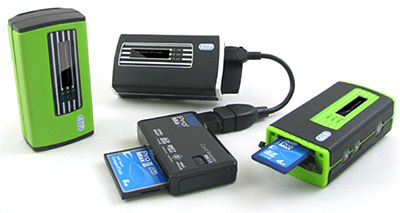 ATP's Photo Finder is a pocketable GPS tracking device that lets you insert the SD memory card from your time-synced camera, then it writes the positions directly to the file header of each shot. You can then plot the data with Google Earth to see the location of each photo. The $100 device seems easy enough to use. Just make sure that your camera's internal clock is in sync with the Photo Finder, and that the device is on while you're out taking pictures. When you take a break, just remove the SD card from your camera, insert it in Photo Finder, and the data is added to each shot. Later, when you upload the images to your computer, you'll see the GPD info in the EXIF data. If you shoot RAW, my guess is that you'll have to shoot RAW+JPEG and use Photo Finder for the companion files. Also, it doesn't accommodate CF Cards directly, but as shown in the illustration, can tag them via a USB memory card reader. This is an interesting device that I want to explore more. If you have any experience with it, please post a comment. The Digital Photography Companion is the culmination of two years work. To prepare this book, I spent hours working with photographers and aspiring photographers to find out exactly what they wanted. As a result, I settled on an 8.5" x 5.5" trim size that allows enough room for healthy-sized photographs, yet fits in the backpack, purse, camera bag, or jacket pocket. The book is designed to help you make pictures that distinguish your work from others. By mastering the controls on your camera and learning a few basic techniques, you can create virtually any type of image you want. The book will be your companion for such an endeavor. And you can order it now, and receive it by early March. I also wanted to create a companion site for the book, so we've launched the The Digital Photography Companion online. Here I will publish tips to augment the information in the book, and feature photos from TDS members who have used these techniques to create their own look. More on this once the Companion is published. In the meantime, I will be adding content to the DPC page regularly. I hope you enjoy this new addition to The Digital Story and share it with your friends. 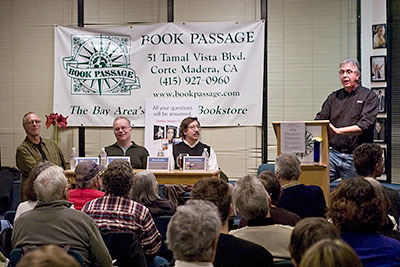 During Sunday night's panel discussion at Book Passage in Corte Madera, and then during the first day of the Aperture workshop at Macworld SF, Raw was still the most popular topic among attendees. I imagine we're in for more Raw discussion at Wednesday's Apple Store event (in San Francisco) that features Mikkel Aaland, Harold Davis, Rick Smolan, and myself. (directions and details here.) The talk starts at 4:30 pm. Ability to recover highlights and shadows better than with Jpegs. Option to change white balance with no quality penalty. More data to work with overall for high quality conversions. I hope to keep the conversation going on Wednesday night at the Apple store. Photo by Colleen Wheeler take with Canon 5D with a 50mm f-1.8 lens.